In April 2010 the then Minister for Communications, Eamon Ryan, proposed changes to the list of sporting events designated as protected for broadcast on free-to-air television. 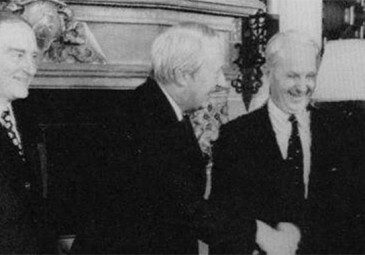 The initial list had been created in 2003 after the furore over the sale of the rights to broadcast Irish soccer international games to Sky Sports.2 A political and public storm of disapproval led to a change in the law and, using a 1997 amendment to the EU’s Television Without Frontiers3 directive, the then Fianna Fáil-PD government created a list of sporting events which could now only be shown on free-to-air television. Placed on the list were the Summer Olympics; the All-Ireland senior football and hurling finals; the Republic of Ireland’s World Cup and European qualifying games and Finals’ games; the opening games, semi-finals and final of the World Cup and European Championship Finals; Ireland’s matches in the Rugby World Cup Finals; the Irish Grand National; the Irish Derby; and the Nations Cup at the Dublin Horse Show. Surprisingly, the Six Nations rugby championship was not placed on the list; nor was the Heineken Cup competition (less surprisingly, as that competition had yet to attain the status which it now holds). In April 2010, Eamon Ryan announced that he was proposing to add a number of new events to the free-to-air list. These included the Heineken Cup matches involving Irish provincial teams and the Six Nations rugby championship, as well as the GAA provincial finals, and the All-Ireland quarter- and semi-finals in football and hurling. Also proposed for addition was the Cheltenham horse-racing festival. Determined to retain absolute control over the sale of their rights to whomsoever they chose, the Irish Rugby Football Union – supported by the provincial rugby bodies – launched an impressive counter-attack. In this they were assisted by the rugby correspondents of all the national newspapers. Further support came from Simon Coveney, then the Fine Gael Communications spokesperson who repeatedly proclaimed that ‘Ryan’s interference threatens to destroy the golden era of Irish rugby.’4 Interestingly, Coveney had previously been outspoken in his criticism of the FAI in 2002 and of the then Fianna Fáil-PD government for allowing the sale of the rights to Irish soccer matches to Sky Sports. Back then, Coveney blamed the Government for allowing a pay-to-view channel to buy the rights to Irish soccer internationals, saying it was a failure that had let down the ordinary Irish fan: ‘The decision is a blatant commercial decision by the FAI and a selfish one which will result in a lot of people having to pay for the enjoyment of seeing the Irish team play at home.’5 And yet no-one was more outspoken in his criticism of Éamon Ryan’s proposal than Simon Coveney. Ultimately, Ryan’s proposal fell with the government of which he was part and there is no realistic prospect of it being revived by the current Fine Gael-Labour government. It has always been a major challenge for sports organisations to decide how best to present their sports on television. The phenomenal growth of rugby in Ireland over the past decade is a tribute to rugby’s administrators and their capacity to extend rugby into areas where the game previously had no meaningful support. This is particularly true of Leinster. Striking the balance between using television to promote the game and using television money to pay its professional players is no straightforward matter. Nonetheless, compelling evidence illustrates how the sale of the rights of major sporting events has created a new elitism in which people who are older or poorer or who live in rural areas are disproportionately excluded from watching such matches on television. The move of Heineken European Cup Rugby from RTE to Sky Sports demonstrates this clearly. 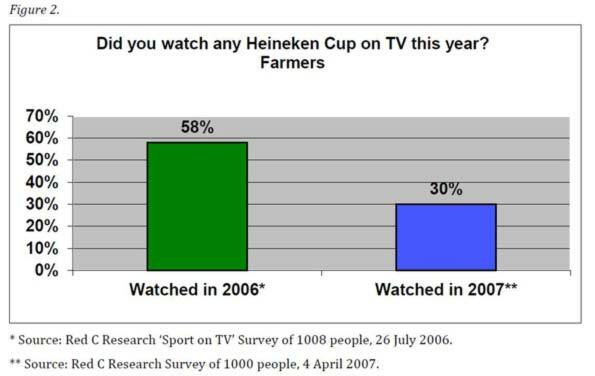 Considerably fewer people watched Heineken Cup Rugby when it was shown exclusively in Ireland on Sky in 2007 than when it was free-to-air on RTE in 2006. A direct comparison can be made between the quarter-finals of the competition in successive years, played in the aftermath of successful international rugby seasons which saw Ireland win the Triple Crown and enjoy unprecedented media profile. On Saturday, 31 March 2007 Leinster played an away Heineken Cup quarter-final against London Wasps. The game was shown live on Sky Sports 1. The previous year at the quarter-final stage Leinster had played away at Toulouse, again on a Saturday afternoon, 1 April 2006. This game was shown free-to-air on RTE. 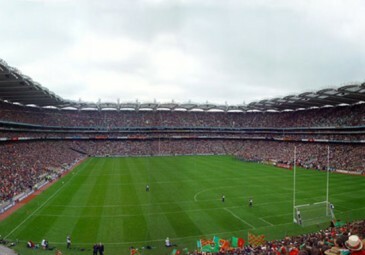 255,000 people watched the 2006 match on RTE, 47,000 watched on Sky in 2007. The number of children under 14 watching the Leinster quarter-final match dipped from 27,000 on RTE in 2006 to 2,000 on Sky in 2007. The number of women who watched the 2006 match on RTE was 67,000 and on Sky in 2007 the number was 9,000. The number of people in rural areas who watched the 2006 match on RTE was 111,000, while the number who watched the Sky match in 2007 was 9,000. The decline in people watching the quarter-final was particularly pronounced in Connacht-Ulster where the number of viewers fell from 45,000 for the 2006 RTE broadcast to 3,000 for the Sky match in 2007. 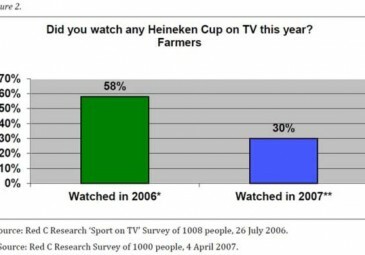 The number of farmers who watched the matches fell from 19,000 on RTE in 2006 to just 1,000 on Sky in 2007. The number of people over 55 who watched the match fell from 98,000 on RTE in 2006 to 14,000 on Sky in 2007. 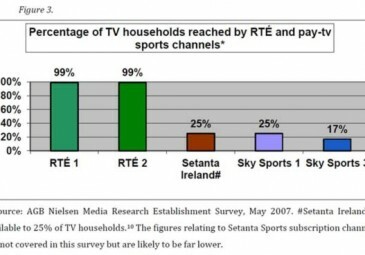 Comparing the results of the 2007 survey with a similar survey commissioned by RTE in 2006, there is clear evidence that the impact on a sports organisation of moving to pay-tv channels creates a significant divide between who does and does not watch sport on television. The decline in viewing figures is particularly steep for those over 65, and in rural areas, notably amongst farmers. Moving sports events to pay-tv doesn’t just reduce the potential overall size of the audience; it also divides viewers into those who can afford to pay and those who cannot. 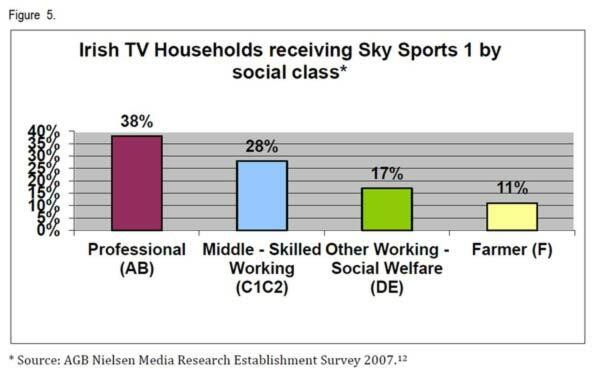 The pay-tv sports channels reach a much smaller proportion of all classes of Irish television households than free-to-air channels, but the gap is even more pronounced for those on lower incomes, farmers, the elderly, and those on social welfare. Figures 4 and 5 below provide clear evidence of this. 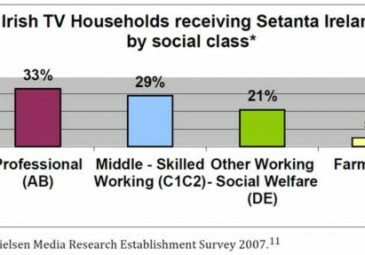 Figure 4 shows that, although only 33 per cent of professional households receive the Setanta Ireland channel, they are still more likely to have Setanta Ireland than working class households, or those dependent on social welfare. 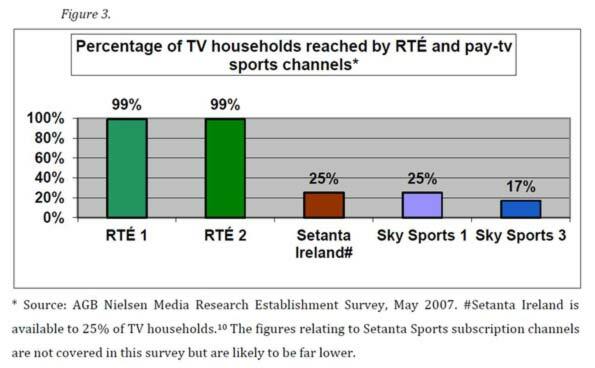 They are also almost seven times as likely to have Setanta Ireland as farming households. 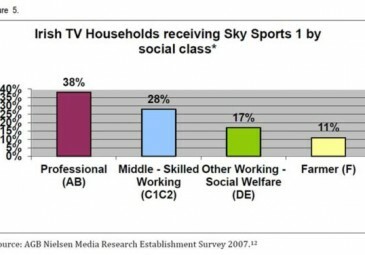 The comparative figures for Sky Sports 1 are similar (See Figure 5) and, taken together, the graphs illustrate the direct correlation between social position and access to pay-tv sports channels. The story of the relationship between television and the Heineken Cup is not unique; it is remarkably similar to what occurred with cricket in England. For several centuries cricket has been intimately associated with the basic idea of what it means to be English. Just as hurling is perceived as something uniquely Irish, so it is with cricket and England. The game may have been transported around the world with the spread of the empire, but it has always remained the most English of games. Its origins are lost in the Middle Ages, but since the eighteenth century it has had an organised and central presence in English life. Crucially, although the game has often been perceived in Ireland to have been elitist, often tied with the English aristocracy, cricket is the game of all the people. At the top of the pyramid stands the English international side; a level below that stands the English county game; at the next level comes league cricket, played within counties on a serious, mostly amateur basis; and, then, beneath that again comes the critical mass of village cricket and of recreational cricketers. Village cricket and county cricket have traditionally been the source of enormous local pride, engendering deep feelings of loyalty and passion. The place of thriving local cricket clubs across England is not entirely dissimilar to that played by GAA clubs in Irish life. They are the focal point of communities, lending not just colour and vibrancy, but also acting as a bond of unity within communities. As the game evolved through the decades it came under pressure from a variety of other sports, notably soccer and rugby, which undermined the prosperity of cricket in certain regions. It has also been the case that the volunteerism that has for so long been the bedrock of local clubs has been undermined by changes in lifestyles, work-practices and commuting. Cricket was shown live on BBC television from 1938 to 1998. The first live televised broadcast of a cricket match was the coverage of the second Ashes test between England and Australia from Lords on 24 June 1938. In 1990 Sky Sports won the rights to show all the test matches played during England’s tour of the West Indies. The BBC retained the rights to show all England’s home test matches until 1998. In that year, Lord MacLaurin, the then chairman of the England and Wales Cricket Board, convinced the British government to remove test cricket from the protected list of broadcast events – the ‘crown jewels’ of English sport which included the Wimbledon Tennis championships, the Grand National steeplechase and the FA Cup final. Freed from their legal obligations, in 1999 the England and Wales Cricket Board (ECB) sold the rights to cover test cricket as a joint-package to Channel 4 and Sky Sports.This deal effectively gave Channel 4 the right to screen free-to-air all but one home test match every year, and also gave them the rights to a highlights package. Sky Sports screened all England’s away tests and one home test. The BBC had bid for the rights, but had been unsuccessful. No live test cricket has been shown on the national Public Service Broadcaster since then. The decision to share the rights between Sky Sports and Channel 4 offers clear comparative information on the reach of television channels for identical events. 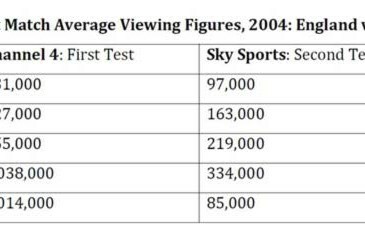 The contrast between the viewing figures of those who watch live test match cricket on free-to-air television as against those who watch it on pay-tv can be seen from the viewing figures for the test series between England and New Zealand in the summer of 2004. 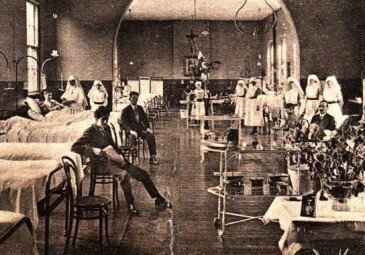 The first test in the series was broadcast free-to-air on Channel 4, while the second test was broadcast on Sky Sports. The highpoint of Channel 4’s coverage of English cricket came in the summer of 2005 with an epic Ashes test series played against Australia. England had entered the series as outsiders and was not fancied to win the Ashes which had been dominated by Australia for 20 years. In an enthralling series of matches played out against the backdrop of growing national fervour, England narrowly scraped a victory. The public outpouring led to an open-top bus tour around London, civic receptions and street parties, and saw cricket move to the very centre of public life in Britain. This was a position it had not held for decades; the game finally moved out from under the shadow of soccer. 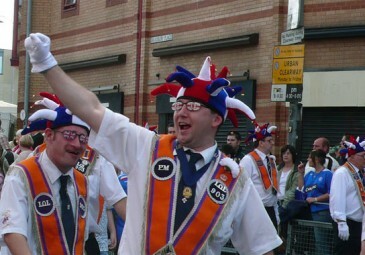 The committee noted that, in Britain, a listed event is one that is generally felt to have special national resonance. It should contain an element which “serves to unite the nation”, be “a shared point on the national calendar”, and be “not solely of interest to those who follow the sport in question”. It should also command a large television audience and have a history of being broadcast live on free-to-air services. The committee continued: “… in a nation of sports lovers, it is imperative that some protection must exist for some sporting events.” And cricket was one of those events. For the 2006-7 Ashes test series in Australia, the matches were shown exclusively live on Sky Sports. Audiences for the 2005 Ashes series between England and Australia had been consistently high and peaked at a viewing public of 8.4 million. This was a little over half of everyone watching television in Britain at that time. By contrast, the 2006-7 Ashes series between England and Australia did not draw more than 500,000 viewers. Even allowing for the less amenable viewing time for the 2006-7 series and England’s defeat, the collapse in viewing figures was a major blow to the profile of cricket in England. c. Those who don’t watch it at all. The evidence that emerges from the sale of the Heineken Cup and English cricket television rights to a pay-tv company is clear-cut. Moving to pay-tv profoundly alters the nature of sports organisations. For everybody engaged with the sport – players, grassroots members, spectators and television viewers – pay-tv introduces a dramatic, new dynamic. For all that vast sums of television money can benefit an organisation as it seeks to meet its expenses or develop its sport, there is always a pay-off. That pay-off involves the creation of elites – an elite collection of clubs who profit most from television money and an elite level of player who gets paid inordinate sums of money. The reality of pay-tv is that it not only drives up the money paid to players in sports which are already professional, but it also drives the creation of professionals in sports which were previously amateur. Alongside the creation of elites within sports comes the reinforcement of divides amongst those who watch on television. 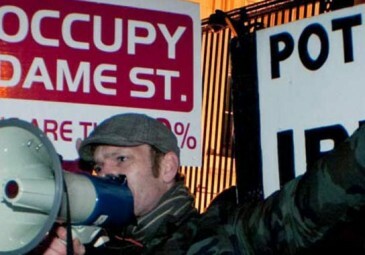 The strength of universal public service broadcasting is that it provides equality of access to every community within a country – pay-tv subverts this equality. The evidence is everywhere: when a sport moves to pay-tv, people who are older or poorer or who live in rural areas are substantially less likely to be able to watch it, regardless of their interest in or commitment to that sport. But, even in cities, significantly fewer people watch sport on pay-tv than watch it on free-to-air channels. Perhaps the most potent aspect of pay-tv channels is that, once they secure broadcasting rights to a sport, that sport finds it almost impossible to determine its own future. Pay-tv money re-orders sports organisation to such an extent that it appears to become inconceivable to imagine life without it. The Chief Executive of Setanta Sports in Ireland has written that the argument about whether sports should be shown only on free-to-air television is now irrelevant because sports organisations “have become dependent upon the increased revenues” from pay-tv companies.38 Essentially, sports organisations that have signed their rights over to pay-tv companies have, indeed, become dependent on the money which is earned through such deals. In turn, pay-tv companies – run as corporations and owned in large measure by venture capitalists – must find the money to pay for these deals and to generate profit for their shareholders. To do this, they generate income from the die-hard supporters of sports who must now pay a subscription in order to watch matches on television. It has always been a major challenge for sports organisations to decide how best to present their sports on television. In the last decade, it is clear that the increase in the sums of money paid by broadcasters to secure sports rights has redrawn the relationship between television and sport. At its best, this relationship is a finely-balanced, mutually-beneficial partnership. At its worst, it leaves sports organisations vulnerable to the demands of private television companies who exploit sport for financial gain. Even 50 years ago, there were prescient warnings that unregulated, commercialised television would seek “… to exploit sports to the utmost.”39 Since then there have been numerous examples of how pay-tv has exploited sporting organisations, sports men and women, and sports supporters in pursuit of profit. For a brilliant treatment of this incident see Roddy Flynn, ‘Tackling the Directive: Television Without Frontiers and Irish soccer.’ in Trends in Communication, Vol. 12, 2/3, pp. 131 – 152. See, for example, a press release issued on 18 May 2010. www.simoncoveney.com. RTÉ News, 5 July 2002. AGB Nielsen Media Research, 31 March 2007 and 1 April 2006. Red C Research surveyed 1000 people with quotas set and data weighting to ensure the sample was randomly representative of the total Irish population 18+. Field work was conducted from 31 March to 4 April 2007. 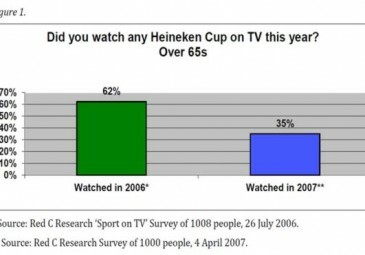 By contrast 83 per cent of the same group said they had watched Munster Heineken Cup games at home on RTÉ in 2006. 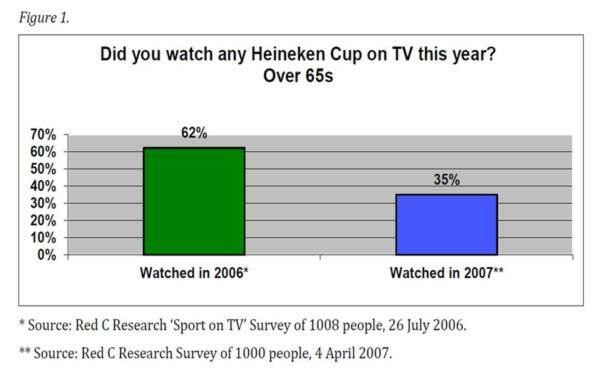 Once more, by contrast, 63 per cent of the same group said they had watched Munster Heineken Cup games at home on RTÉ in 2006. AGB Nielsen Media Research Establishment Survey May 2007 (published September 2007). Nielsen Media Research Establishment Survey 2007 (published September 2007). ESRI, Fair Play? Sport and social disadvantage in Ireland (2007), p. xii. Richard Holt, Sport and the British (1989); Derek Birley, A social history of English cricket (1999). House of Commons Select Committee on Culture, Media and Sport, Broadcasting Rights for Cricket: Ashes to Ashes – the death knell for live Test match cricket on free-to-air TV? (2006), p. 15. Financial Times, 19 November 2005. Roland Watson, Wisden Almanack (2006). Richard Gillis, The future of sports marketing (2006), p. 21. BBC News, 15 December 2004. Financial Times, 16 December 2004. The Guardian, 15 December 2004. The Observer, 19 December 2004. House of Commons Select Committee on Culture, Media and Sport, Broadcasting Rights for Cricket: Ashes to Ashes – the death knell for live Test match cricket on free-to-air TV? (2006), p. 16. Ibid. 27 Daily Telegraph, 17 August 2005. The Culture, Media and Sport Committee is appointed by the House of Commons to examine the expenditure, administration, and policy of the Department for Culture, Media and Sport and its associated public bodies. House of Commons Select Committee on Culture, Media and Sport, Broadcasting Rights for Cricket: Ashes to Ashes – the death knell for live Test match cricket on free-to-air TV? (2006), p. 3. House of Commons Select Committee on Culture, Media and Sport, Broadcasting Rights for Cricket: Ashes to Ashes – the death knell for live Test match cricket on free-to-air TV? (2006), p. 1. House of Commons Select Committee on Culture, Media and Sport, Broadcasting Rights for Cricket: Ashes to Ashes – the death knell for live Test match cricket on free-to-air TV? (2006), p. 18. The Times (London), 13 September 2006. The Independent (London), 28 November 2005. The Guardian, 17 October 2005. The Observer, 19 December 2004 and The Independent, 18 April 2005. Steven Barnett, Wisden Almanack (2007). Sunday Business Post, 29 January 2006. Anthony Smith, Television: an international history (1995), p. 154.